Our Lady of Lourdes, chosen from all eternity to be the Mother of the Eternal Word and in virtue of being the Immaculate Conception, we kneel before you as did young Bernadette at Lourdes and pray with childlike trust in you that as we contemplate your glorious appearance at Lourdes, you will look with mercy on our present petition and secure for us a favorable answer to the request for which we are making this novena. 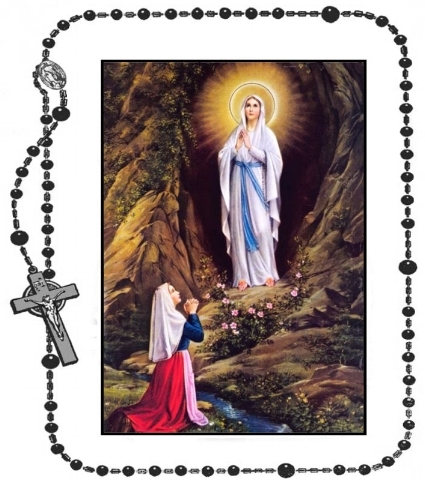 We give you thanks, Almighty God, for sending your Blessed Mother to the Grotto of Lourdes, saying to Saint Bernadette: I am the Immaculate Conception. O Immaculate Mary, inflame our hearts with one ray of the burning love of your pure heart. Let them be consumed with love for Jesus and for you, in order that we may merit one day to enjoy your glorious eternity. O dispenser of His graces here below, take into your keeping and present to your Divine Son the petition for which we are making this novena. O Mary, conceived without sin, pray for us who have recourse to thee. O star of sanctity, as on that day in Lourdes you spoke to Bernadette and a fountain sprung forth from the ground, bringing with it miracles from our Lord. Now I beseech you to hear our fervent prayer and grant us the petition we now so earnestly seek. Queen of Heaven, we your wayward children join our unworthy prayers of praise and thanksgiving to those of the angels and saints and your own. We pray the Holy Trinity may be glorified in heaven and on earth. Our Lady of Lourdes, as you looked down with love and mercy upon Bernadette as she prayed her rosary in the grotto, look down now, we beseech you, with love and mercy upon us. Obtain for us the graces from your Divine Son and dispense them to us in in our needs, in particular for the special favor we seek in this novena. O Mother of God and our mother, from the heights of your dignity look down mercifully upon us while we, full of confidence in your unbounded goodness and confident that your Divine Son will look favorably upon any request you make of Him in our behalf, we beseech you to come to our aid and secure for us the favor we seek in this novena. O Blessed Mother, so powerful under your title of Our Lady of Lourdes, to you we raise our hearts and hands to implore your powerful intercession in obtaining from the gracious Heart of Jesus all the helps and graces necessary for our spiritual and temporal welfare and for the special favor we so earnestly seek in this novena. Father in Heaven, who by the Immaculate Conception of the Blessed Virgin Mary did prepare a worthy dwelling place for your Son, we humbly beseech you that as we contemplate the apparition of Our Lady of Lourdes, we may be blessed with health of mind and body. O most gracious Mother Mary, beloved Mother of Our Redeemer, look with favor upon us as you did that day on Bernadette and intercede with Him for us that the favor we now so earnestly seek may be granted to us. O Mary our Queen, from heaven itself you came to appear to Bernadette in the Grotto of Lourdes! And as Bernadette knelt at your feet and the miraculous spring burst forth, O Mother of God, we kneel before you today to ask that in your mercy you plead with your Divine Son to grant the special favor we seek in this novena. Immaculate Mother of our Lord Jesus Christ, to you we raise our hearts to implore your intercession in obtaining from the benign Heart of Jesus all the graces necessary for our spiritual and temporal welfare, particularly for the grace of a happy death. O Mother of our Divine Lord, as we conclude this novena for the special favor we seek at this time. Mother most merciful, to whom shall I go in my misery if not to you who pities us poor sinful exiles in this valley of tears? In our name, offer Jesus but one drop of His most precious blood, but one pang of His loving heart. Remind Him that you are our sweetness, our life and our hope, and your prayer will be heard. Amen.